The Moto X Play does a lot right with an impressive camera, superb battery life and attractive price, but there's a frustrating number of missing features and options. Update: Still using the Moto X Play as your daily driver? Then, you'll be happy to know that Motorola has confirmed that Android Nougat is headed to your device and you won't have to wait long. GSM Arena pointed out that Motorola's German arm has confirmed a Nougat launch for the Moto X Play in late January, at least in Europe. That means is should be heading to the US shortly afterward. What's so good about it? While it may not be the visual overhaul seen with Android Lollipop, Nougat is all about refinement. For example, you'll be able to reply to text messages within the notifications. Also, split-screen app support will make working hard (or goofing off) even more efficient. Lastly, the Doze mode that brought about greater battery savings at night in Android Marshmallow now works during the day. The improved algorithm can detect when the phone isn't in use – even when it's in your pocket – and go into a deep, energy-saving sleep. Motorola clearly wasn't satisfied with one flagship smartphone in one year. 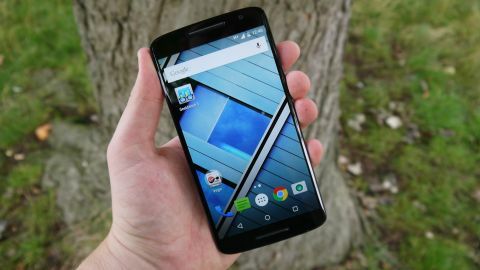 For 2015, the company released a whopping three versions of the Moto X: the Moto X Force, a flagship with a shatterproof screen, the Moto X Style, a high-end and stylish handset, and here, the Moto X Play: a slightly more affordable phone designed for people on the go but still packed with superior features. As the name suggests, the Moto X Play is designed for adventurous types who need a battery that keeps going as long as they do, and a handset that won't break at the slightest knock. While the Moto X Play isn't available in the US, it can be picked up on Amazon in the UK and elsewhere. The phone costs £279 for the SIM-free 16GB option, and while the X Play launched with a 32GB version, we're having a hard time finding them for sale. Do keep in mind that at this time, opting for the Moto G4 Plus might be a wise idea. If anything, it'll save you some cash. Compared to the X Play, the G4 Plus may not have as good of a camera or the super slick looks, but it makes up for it with a fingerprint sensor, a slightly faster processor, and a much lower price. You can pick one of these up for $249 (£229, AU$399). In addition, the Moto Z Play is another option if you want a more premium smartphone, with faster innards and modular support by way of Moto Mods. It's difficult to see where the Moto X Play is meant to fit in Motorola's range of smartphones – and the design only further muddies the waters. The Moto X Play certainly feels more premium than the Moto G, but this version isn't as high-end as some of the phones it aspires to take on, such as the OnePlus 2. Everything about it feels very slightly off, and this is a shame. With just a minor polish to the design, the Moto X Play could have offered a lot more for the money. The phone fits perfectly in the hand, which is an impressive achievement considering it has a 5.5-inch display slapped in the middle – that's toward the higher end of the screen size range, and would have been considered a phablet two years ago. Along the top and bottom are two slim bezels, which both house speakers along with an earpiece at the top and microphone at the bottom. The front-facing camera is somewhat hidden away in the top-right corner, but by minimising the bezels the Moto X Play can offer a compact frame without compromising on screen size. It's the complete opposite of my gripe with the iPhone 6 Plus, which houses the same size screen but is much bigger, with large strips at the top and bottom of the phone. The phone has an arched back – it's 10.9mm thick in the middle but slimmer at the edges – and this enables the phone to sit in the hand more easily. It also enables the phone to appear thinner than it actually is, as well as housing a lot of extra battery power. The edges of the phone have a metal framework, making it feel and look quite premium. The 3.5mm headphone jack sits right in the middle of the top edge, which can feel like an odd placement with some headphone designs. When the phone is in a pocket it can be irritating – I'd rather have it closer to one of the edges, or I'd have to use wireless headphones. Alongside the jack sits the SIM and microSD card drawer, which you can pop out using a small tool. The left edge of the phone is clear of buttons, while the right side houses the power button a third of the way down, with the volume rocker below. The power button features subtle texturing, which makes it easier to find if you're fumbling around and not looking at the phone. Right in the middle on the bottom edge is the microUSB port – it's a shame there's no USB-C support here, because I can see myself scratching the bottom edge trying to slot the connector in. The phone is water resistant, so it can survive the odd splash of water. The problem here is that it's not fully waterproof, as we've come to expect from, say, the Sony Xperia line of flagship phones. There's no point in half measures here. If Motorola is suggesting the phone is durable enough for adventurous outdoor types then it doesn't make sense to make the phone only partly resistant to water when it could be fully waterproof. The name of the game with the Moto X Play is customization. You can customise the phone's design via the Moto Maker website, where you can choose from 14 colour backs and seven accent colours along the camera module section on the back and the speaker grills on the front. There's a good variety of colour choices here, but I didn't get the chance to try them out – if I had, I'd have gone for a much more vibrant look than that of the phone you can see in the photos. The problem is you can't do much else – there's only a choice of white or black front colours. It's a nice touch being able to customise the look of your phone, but I don't feel Motorola has gone far enough on the Moto X Play. If you head into the Moto Maker application for the Moto X Style you'll find a choice of materials for the back as well as colours, including wood and leather. With the Moto X Play it feels like you're restricted to paint-by-numbers customisation, rather than being able to 'build' your perfect phone.